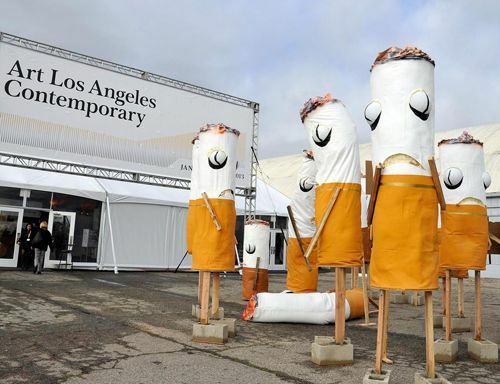 Artist Jon Pylypchuk debuts “It's not you, it’s me, I will always love you dear”, a new large-scale installation at the entrance to Art Los Angeles Contemporary. With the sculptures standing between six and nine feet tall and arranged into small groups, the space becomes the site of a cartoonish political rally. A new installation by artist Jon Pylypchuk titled “It’s not you, it’s me, I will always love you dear”. 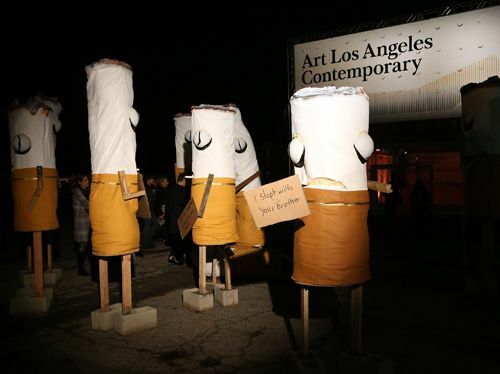 The installation consists of a disgruntled cast of characters with bodies constructed and painted to resemble discarded cigarettes endowed with human attributes of wooden arms and legs. Some have been equipped with picket signs bearing a range of messages from ad hominem attacks to libertarian slogans to new age mantras and zen koans. With the sculptures standing between six to nine feet tall and arranged into small groups, the space becomes the site of a cartoonish political rally. Jonathan Pylypchuk’s work includes sculptures, paintings and drawings. His work has been featured at Museum of Contemporary Art in Cleveland, Museum of Contemporary Art in Detroit, the UCLA Hammer Museum, the ZKM Museum in Germany, the Royal Academy in London, the State Hermitage in St. Petersburg, and the Musee d’Arte Contemporaine, Montreal. His work is in public collections such as Museum of Contemporary Art, Los Angeles, Museum of Modern Art, New York, and the Whitney Museum of American Art, New York. Pylypchuk is represented by participating galleries International Art Object Galleries, Fredric Snitzer Gallery and Galerie Hussenot.